[S205] Newspaper, Boston Daily Advertiser, (Boston, MA) Tuesday, March 02, 1897. [S607] Website billiongraves.com (http://www.billiongraves.com/) "Chestnut Hill Cemetery." [S149] American Ancestors, , Marriages and Marriage Intentions of Standish, Maine, 1786-1900. [S106] Maine Families in 1790, vol. 8 p. 316. 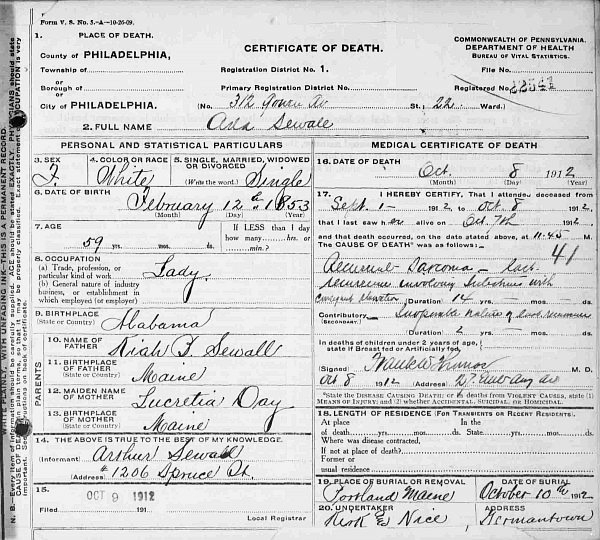 [S89] Family Search, Pennsylvania, Philadelphia City, Death Certificates, 1803-1915. [S392] Website findagrave.com (http://www.findagrave.com/) "# 119035984." [S89] Family Search, Vital records of Augusta, Maine, to the year 1892 Conant, Ethel Colby. [S205] Newspaper, Woodland Daily Democrat October 18, 1906. [S392] Website findagrave.com (http://www.findagrave.com/) "# 61258702." [S207] 1910 US Census, Chico Ward 2, Butte, California. [S232] Ancestry.com, National Archives and Records Administration (NARA), Washington D.C.; Passport Applications, January 2, 1906 - March 31, 1925; Microfilm Serial: M1490;Roll # 47. [S205] Newspaper, Bar Harbor Times, 1 February 1928. Rev. Albert Cole Sewall D.D. [S205] Newspaper, The Congregationalist, (Boston, MA) Thursday, March 06, 1873. [S205] Newspaper, Boston Daily Advertiser, (Boston, MA) Wednesday, February 02, 1887. [S206] 1920 US Census, Canandaigua Ward 3, Ontario, New York. [S232] Ancestry.com, New York, Death Index, 1852-1956. [S364] Eben Graves, The descendants of Henry Sewall. Vol. II (Unpublished), #613. [S205] Newspaper, Medicine Hat News, November 14, 1931. [S392] Website findagrave.com (http://www.findagrave.com/) "# 104067257." [S392] Website findagrave.com (http://www.findagrave.com/) "# 41833368." [S205] Newspaper, Medicine Hat News, March 09, 2007. [S205] Newspaper, Medicine Hat News, June 20, 1936. [S392] Website findagrave.com (http://www.findagrave.com/) "# 126674875." [S205] Newspaper, The Calgary Herald, 9 March 2007. [S460] MI, "Oak Rest Cemetery, Medina, Bandera, Texas." [S130] Massachusetts Vital Records, Vol: 501 ; Page: 512 (for place of birth). [S232] Ancestry.com, Chelmsford, Massachusetts, City Directory, 1940. [S205] Newspaper, The Fitchburg Sentinel, 10 May 1939. MELROSE. April 26—Albert W. Sewall, 85, for many years in the insurance business in Boston, died today at his home, 99 West Emerson St. A native of Boston, he was for years a member of the firm of Ide & Sewall, later becoming special agent for the North British & Mercantile Insurance Company and for the past 20 years had been an independent loss adjuster. He was a Mason. [S205] Newspaper, The Boston Globe, 27 Apr 1939. [S392] Website findagrave.com (http://www.findagrave.com/) "# 116515368." [S392] Website findagrave.com (http://www.findagrave.com/) "# 149568797." [S107] 1880 US Census, Corinna, Penobscot, Maine. [S392] Website findagrave.com (http://www.findagrave.com/) "# 3632037." [S232] Ancestry.com, U.S., Select Military Registers, 1862-1985. [S205] Newspaper, San Antonio Light, 5 November 1928. [S232] Ancestry.com, California, Marriage Index, 1949-1959. Alfred Cottingham Sewall was born on 16 January 1875 in Seaford, Sussex, Delaware.2 He was the son of George Ward Sewall and Mary Franklin Cottingham.1 Alfred Cottingham Sewall died after 1940. [S89] Family Search, Unsourced IGI Record Batch M019998. [S130] Massachusetts Vital Records, Image not available, March 2007. [S208] 1900 US Census, MA, MIDDLESEX, 6-WD MELROSE. Portrait and still-life painter, illustrator, and poet. The eldest daughter of Frank Sewall, a New Jerusalem minister and first president of Urbana College, she was raised in Urbana (Champaign) and educated privately. She studied in South Kensington, Glasgow, Florence, and Paris and, during the 1890s. with Howard Helmick in Washington, D.C. In 1899 she was married in Washington to John H. James, a lawyer, banker, and builder of the Mad River & Lake Erie Railroad. They settled around 1903 in Urbana, where she wrote verse for The Century, Woman's Home Companion, Cosmopolitan, and other national magazines and designed altarpieces and murals for a number of churches from Massachusetts to California. Toward the end of her life, she moved to Columbus (Franklin). Jeffrey Weidman: Artists in Ohio, 1787-1900: A Biographical Dictionary, p. 451. [S392] Website findagrave.com (http://www.findagrave.com/) "# 94603397."